The Urban Design Program at Columbia is investigating climate response at multiple scales and collaborating with partners in institutions around the world and within the University from science & engineering, journalism, conflict resolution, economics and social justice. We aim to marshal the observations of the world’s best scientists and the agency of design toward action and defined, replicable climate adaptation projects in the world’s most vulnerable regions. We bring synthetic design thinking to this process and a stance of activism and engagement and believe that by building physical, resilient places we engage and educate communities about the risks they face. How we live with - and design for- water will be a central, defining element of the next century relative to climate change and urbanism. Jordan is one of the most water scarce countries in the world, and also is threatened with extreme heat due to climate change. This situation is exacerbated by political and social conflict with neighboring countries. Water is constantly in motion, changing states, crossing borders, nourishing (and destroying) life. How can water and urbanism be considered together as a generative frame for urban design practice, social life, and ecological regeneration? The spring semester 2017 design studio investigated urbanization challenges in two regions with robust ecological contexts, intense migration, resource conflicts, and urban growth trajectories: Amman and the Lower Jordan River Valley, and Kolkata, India and the Sundarbans tidal mangrove forest. In both cases, the studio explored the dynamics of climate adaptation relative to migration and climate change, alongside the generation of new social infrastructure, public space and urban design in an expanded rural-urban context. 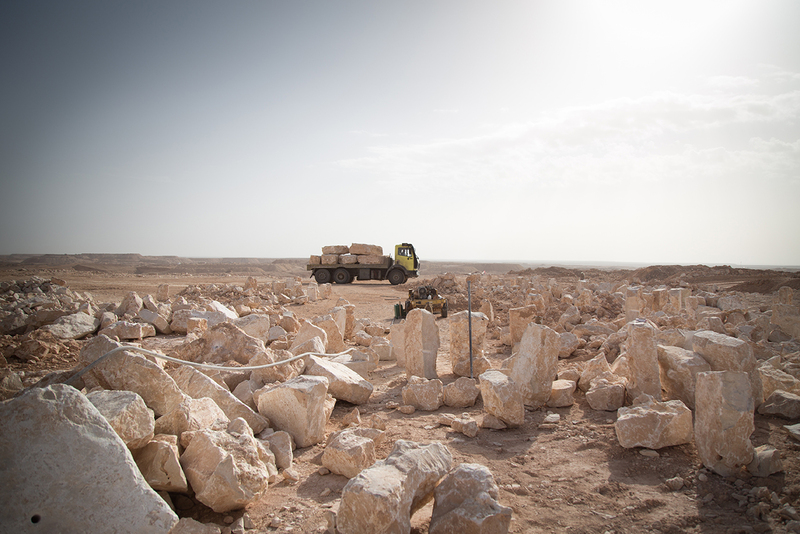 The seven projects represented in this volume operate at multiple scales, linking territorial independencies, to operational landscapes, to pilot sites of detailed investigation for design exploration and on-the-ground change in Jordan. Special thanks to Jawad Dukhgan of Studio X Amman and Columbia Global Centers_Amman. The Jordan River Valley runs through heart of Middle East and serves as a border zone, a landscape symbol, a space of cultural and religious heritage, and an agricultural lifeline for the region. It carries deep links between ancient water infrastructure and civilization. How can Amman adapt to water scarcity and extreme heat? Amman, situated to the east of the valley, is the capital of Jordan and the country’s economic, political and cultural center. The city has a population of over 4 million and a land area of approximately 650 square miles. With Syria enmeshed in a tragic and violent conflict to the North, Saudi Arabia and Egypt to the South, and Israel to the east, Jordan has traditionally played a mediating and relatively stabilizing role. However internal and transborder migration patterns combined with environmental stressors and overtaxed infrastructure have shifted political dynamics. While some spaces in the River valley are lush wetland ecosystems, in other zones the water is channeled into narrow, polluted linear drains. Water diversion from the valley has reduced its flows to a fraction of historic levels. The Dead Sea water levels are dropping precipitously leaving behind a wake of hazardous sinkholes and an abandoned tourist economy. Agriculture and industry demand on the region’s water supply conflict with daily subsistence use by poorer communities and for urban uses, all of which are further exacerbated by Israeli Palestinian conflict. Many water bodies are in a state of decline with increasing environmental degradation and pollution from human waste and industrial effluent. The studio considered the future of Amman as a living organism as it continues to experience growth, both on a temporary and permanent basis. Student projects aim to discover: what are alternative spatial and political organizations possible relative to water new eco-agro-industrial paradigms? What are the economic investments that will characterize next century Amman, and how can urban design scenarios that are based on resource recovery instead of extraction & waste paradigms advance change? How can borderlands become spaces of production and exchange? A series of mapping workshops was interspersed and linked to the studio pedagogy throughout the semester. Maps are not neutral objects, they hold political and social data and formulate arguments by layering diverse types of information onto one image. Maps can visualize the invisible by helping a user to navigate toward unexplored landscapes and places; bu maps can also normalize a speculative project because in the end most people think that maps are true. There are many shades of grey between these two positions – invisibility and speculation. Tracing the transformation of land cover patterns and urbanization over time has been critical in our discussions. One of the most important applications of remote sensing is land use/land cover change mapping. The availability of free Landsat satellite images that have been in orbit since 1972 has made it possible for us to map land cover at different spatial and temporal scales and to create the quantitative analysis of land cover changes at multiple time increments. We challenged the students to interpret the ground condition, and to speculate and recognize how changes of certain features on the ground lend themselves to a story of the process of urbanization and lead to a variety of design responses. What if downtown Amman became a decentralized water harvesting network? 21st Century Qanat project proposes a decentralized sustainable water harvesting network by re-interpreting the Qanat System—a traditional water distribution technology used by the Romans in the region in the 6th Century, which connected, channeled and distributed the underground water through agricultural areas into cities. The project is based on understanding the topography, sub-surface water flows, the movement of water and its relationship with people’s behavior and performance within the community. Through a combination of several scalar operations, like adding a new layer of transportation, renewable energy production and much needed social infrastructures, the project consists in collecting, filtering and distributing gray water, rainwater and street waste water run offs by re-conceptualizing the ground. What Is the Qanat Network? 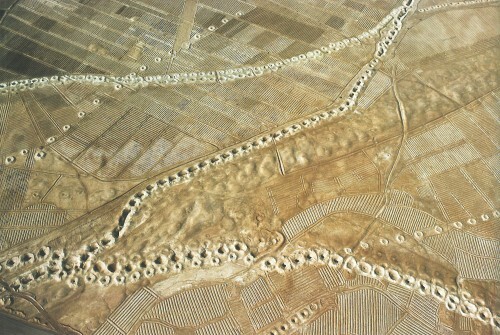 Qanats were constructed as a series of well-like vertical shafts, connected by gently sloping tunnels. Qanats efficiently delivered large amounts of subterranean water to the surface without the need for pumping. The water drained by gravity, typically from an upland aquifer, with the destination lower than the source. Qanats allowed water to be transported over long distances in hot dry climates through rural areas, without much water loss to evaporation. The current water infrastructure in Jordan consists of large-scale infrastructures causing ecological, social and economic harm to both the countryside and urban agglomerations, like Amman. These near obsolete infrastructures are mainly pumping drinking water to Amman from across borders. Consequently, the water supply infrastructure, such as pumping stations, artificial dams, canals, and wastewater treatment facilities are being controlled by centralized, high energy consumption entities that are not in sync with the ecological struggles that Jordan is facing related to the lack of water access. 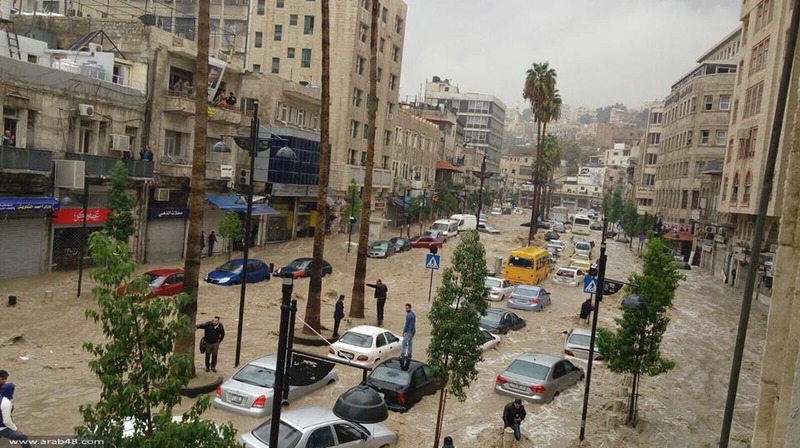 At the same time, Amman is facing short bursts of heavy rainfall, increasing flood risks, storm water runoff that is not percolating into the ground due to impermeable public spaces, resulting in areas of the city and monuments becoming de-facto water tanks during these times. 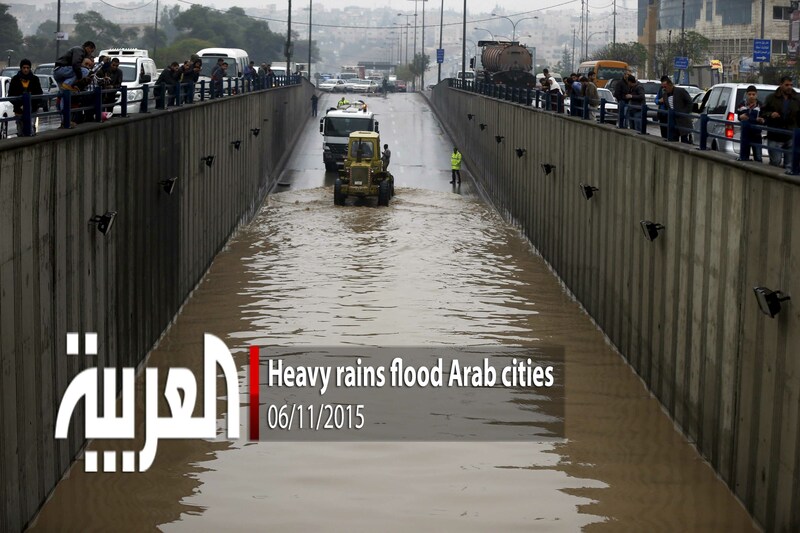 Amman has a historic relationship with water. By taking advantage of the natural geography and topography of the area, the project proposes a new sustainable water network to be implemented with complementary systems such as a new layer of transport, renewable energy production and much needed social infrastructures. Currently, the waste water in Amman is being pumped 50 kilometers to a waste water treatment plant- As Samra. The plant is using a five-step process for treatment of waste. The first step is sedimentation, followed by pre-treatment, biological treatment, clarification and chlorination. This cleaning process requires a vast network of pipelines, involves a huge consumption of electric power, and requires a large number of trucks to supply water back to the city. What if we could break and distribute these 5 processes of filtration within the fabric of downtown Amman, and use the city fabric as a treatment plant? Currently, the wastewater in Amman is being pumped 50 kilometers to a waste water treatment plant- As Samra. The plant is using a five-step process for treatment of waste. The first step is sedimentation, followed by pre-treatment, biological treatment, clarification and chlorination. This cleaning process requires a vast network of pipelines, involves a huge consumption of electric power, and requires a large number of trucks to supply water back to the city. The design of each stage of water filtration responds to the scale of the urban context where the interventions are located, and to the characteristics of the existing communities. This new network of water distribution and purification works together with a combination of underground and on the ground systems. Each stage would tap the rainwater, and storm water runoff at different parts of the city. These strategically located and designed interventions spread across downtown Amman would, eventually in 2050, allow an independent localized system of water collection, distribution and reuse, moving away from the large mega-infrastructural systems proposed for Jordan. The network starts within the community, by the people. Greywater (water from kitchens, showers, and sinks) collected by the community is proposed to be transferred into strategically located sedimentation tanks adjacent to bike stations, sponsored by the Ministry of Transportation and the Arab Bank. Filling up the bikes (equipped with tanks) with gray water, people would bike to centrally located community WaterBanks, filtering the gray water as they pedal, because of the system of rotating biological contactor (RBC) installed on the bike. This would not only create the first step of gray water filtration but also a much-needed system of public transportation, overlapping the already proposed bike network in Amman. Aside from the bikes, other existing modes of public transportation installed with RBC’s would also be able to tap into the gray water in the sedimentation tanks and transport them to the WaterBanks. The community WaterBanks are proposed to be located within a distance of 1 km from the bike stations, and serve as the second level of reed bed filtration, where the water is first injected into the ground. The bikes and shared public transport systems exchange the gray water with water credits to be used for personal water needs. It works on a concept opposite to a gas station- injecting back natural resource into the ground. These community spaces are proposed to be funded and developed by the community institutions like mosques and schools in the area and can be used as a library, education and lecture halls for mosques, soup kitchens, strengthening the idea of getting together and socializing as a community. The community Abnar, funded by As Samra and the Ministry of Health and Mineral Resources, is the third stage of UV Ray filtration. It uses solar energy to harness electricity. The water here is purified to the level of groundwater before it is injected into the primary qanat system. The qanats serve as the 4th stage of filtration by reverse osmosis and is proposed to be developed by large mosques, institutions, the ministry of transportation. The qanat network is also connected to the groundwater table at the head of the qanat system. The surface moments of the qanats serve as social gathering spaces in downtown Amman. The last stage of filtration happens at the end of the network, where it is then recirculated within the city using the existing network of channeling. Limestone is the most abundantly found construction material in downtown Amman. The project locally sources different types of limestone blocks to create different grades of porosity within the fabric of downtown Amman, thereby allowing for easy water percolation into the ground. The Community Water Banks are located within a distance of one kilometer from each bike station. Each Water Bank is equipped with a reed bed filtration system providing the second stage of water purification within the network. This is where the water is first injected into the ground. Throughout the use of bikes and shared public transport networks, users can trade the water collected in exchange for water credits, which allows them to increase the amount of drinking water received in a week, reducing the dependency on trucks distributing extra drinking water when the supply from the Municipality is not enough. The main objective of the WaterBanks is to function as an inverse model of a gas station: instead of extracting from the ground, the project proposes to recharge it by injecting water into it. The water banks are proposed to be funded and developed by community institutions like neighborhood schools and mosques and proposes a flexible space that merges with the existing topographic context and that could adapt to different functions developed by the community, such as public libraries, educational and lecture halls, soup kitchens, performing platforms and other social activities that would strengthen the community identity. Khas Parda is proposed to be installed as the facade of the community extension space. When water from the bikes is poured through the khas parda, it trickles down slowly into the reed beds below. An exhaust fan installed at the top of the space, allows fresh air to gush into spaces, through the wet khas parda, thereby cooling the interiors. The Qanats are the fourth stage of the purification network, where the reverse osmosis filtration technique is implemented. The Qanats are proposed to be located along downtown Amman´s wadi (valley), following the footprint of the ancient stream that flowed across the city in the 1930’s. The site around Al Husseini Mosque is the most important political, religious and commercial space in Downtown Amman, and therefore careful care is taken to not hamper the existing functions of the space. The intervention includes a reconfiguration of the ground level and its performance in conjunction with the Qanat. This intervention is proposed to be funded and developed by large institutions, such as Al Husseini Mosque, by applying the charitable endowment established by the Islamic Law. This could also be combined with support from the Ministry of Transportation and the Greater Amman Municipality. The Qanat is the infrastructure within the proposed network that reaches the water table and introduces the groundwater into the water harvesting strategy. The project is based on understanding the ground elevation, the movement of water and its relationship with people’s behavior and performance within the community and the city at large. The project proposes an alternate way of water distribution and transport, community involvement, reconfiguration of the ground, water collection, filtration and injection, replenishing critical groundwater resources and generating a new water-centric urban culture. What if the decentralization of wastewater agriculture catalyzed sustainable models of growth in Jordan’s hinterlands? The agriculture sector in Jordan is responsible for over 55% of the country’s total freshwater consumption while contributing only 3% to the national GDP. Illegal wells extract freshwater for agriculture, in the highlands and the Jordan valley alike, resulting in an over-extraction of the water basins. The aim of this project is to use the underutilized domestic wastewater towards new agriculture practices, thus reducing Jordan’s food imports. Agriculture has historically been a major source of income in Jordan. However, today domestic water supply suffers to due to the overuse of water in irrigation throughout the Jordan Valley and the highlands. Currently, many major cities, including Amman, are serviced by a traditional wastewater treatment plants. Around 30% of all treated wastewater is used in agriculture in the vicinity of individual plants while water from As-Samra (the largest treatment plant with 100MCM capacity) is sent to the Jordan Valley for irrigation purposes. The existing infrastructure suffers due to under-maintenance, leakages and evaporation. The government plans to invest more money into more such treatment plants for currently unsecured areas. To address the problem of water scarcity, the project proposes to decentralize agriculture from the Jordan Valley by coupling agricultural fields with treated wastewater to enhance the economy and ecology of existing towns in the Northern highland rural areas. Many of the rural areas in Jordan lack a formal waste disposal system. With increasing influx of refugees and migrants, this problem is exacerbated, leading to hygiene and pollution issues. On the other hand, much of the arable land is underutilized due to land ownership structures, and to the lack of agricultural infrastructure and investment. Instead of funding a new municipality sewage system (as proposed by the government), the project proposes a multi-purpose system of reed beds along the wadis to allow for water to be filtered through natural processes. The treated water then is used to irrigate low water consuming crops while the reeds themselves are used at cattle fodder. Secondarily, the nutritious reeds are used as fertilizers in the farmlands and as the construction material in the neighborhoods. The project aims to create a new framework for the coexistence of agriculture and urbanism that leads to the economic revival of the forgotten hinterlands. It creates a sequence of spaces that can reorganize and restructure the territory, offering a frame for future urban expansion. The amount of domestic wastewater available is sufficient to irrigate enough area so as to satisfying 70% of the annual domestic food requirements the surrounding community. After parametrically generating natural water flow lines from the existing contours, wastewater flows along these lines were drawn, channeling water using only gravity while being filtered by the reedbeds. At the edge of the wadi a channel is used to capture the filtered wastewater to distribute it evenly for irrigation. The excess filtered water reaches the lowest point in the wadi thus forming an aquaculture pond which acts as a secondary economy. With densification, the wastewater collection system and housing can co-expand to reach the maximum agriculture capacity. The flow lines were converted into a wetness-dryness map that becomes the parameter for identifying the location for urbanization and the reed-beds. The darker the color of the pixel, the wetter the soil. The edge of the wadi at the junction of housing and agriculture is where the public programs are placed. The pixels can be used as a basis for replication of this pilot project in other villages along the larger wadis. This project envisions future settlements as terrain-responsive Agro-Urban centers, as opposed to the existing consumptive cities and isolated farmlands. Our pilot project proposes a ‘Micro-Agro’ co-op at the village scale that overlooks system implementation and facilitates residential and agricultural land redistribution. The lucrative economic model invites skilled unemployed migrants and refugees, Jordan valley agricultural workers, and Amman city residents alike. The pilot is located in the sub-district Al-Khalidya, Mafraq Governorate with a population of 12,000 people. The first phase consists of collecting wastewater from existing houses and animal farms into strategically placed primary tanks. The wastewater is slowly released into newly cleared reed beds for filtration, while the sludge from the primary tanks is periodically manually transferred to biodigesters that produce fertilizers and biogas. The reed-beds drive the people towards the urban-agro edge that features public spaces with markets, reed processing workshops, and construction training. Successful replication of the system is ensured by agricultural research centers, information and training centers, and crop testing facilities. Jordan’s current wastewater handling system comprises of traditional, energy-intensive, centralized treatment plants that will eventually head towards disrepair. To create a more robust wastewater system, the proposal envisions the government’s investment in a sustainable, resilient and productive system, as it has the potential to create new jobs and increase agricultural production. These interventions will stop the over-extraction of freshwater basins for agriculture and allow Amman to use water from Amman-Zarqa basin rather than importing from the non-renewable Disi basin, shared by Jordan and Saudi Arabia, with an infrastructure covering a 300 km. In the long term, the densification of the new Agro-Urban settlements will reduce the population burden on Jordanian cities. What if the urban fabric of the refugee camp collected water? For a 70-year-old refugee camp that grew organically over the years from a collection of tents into a large informal working class neighborhood, access to resources like water and electricity is a critical matter. An adequate and independent rainwater collection system has the capacity to empower the population towards sustainable access to resources beyond regional limitations while providing a structural basis for future vertical growth in the dense city of Amman. Through a system of decentralized micro-water collection and storage units, the project aims to create an extended network of reservoirs embedded in the built fabric. Within this context, the urban fabric performs as a second topography that can be molded and reshaped through various interventions ranging from the use of elevated light structures that capture and divert the flow of water, to the provision of storage facilities. How can we address water scarcity to empower refugees and raise awareness of the crisis to the world? There are several refugee camps in the Amman Municipality and they are growing with a significant water scarcity. The storage containers, which also filtrate the water using alternative techniques, are hidden in tanks that provide structural support for future vertical growth, or are contained in planters, outdoor seating, stairs and smaller portable devices designed for a seasonal storage. The tanks are interconnected by aqueducts and gutters to assure an equal distribution of the collected water as it overflows from small-scale individual tanks on the roofs into more collective reservoirs in the ground. The sequential overflow of water leads to an underground tank located in the lowest point of the newly reshaped-topography, which also becomes a point of “water revelation“ through a collective usage of water happening in the programs above it. This community space is flexible enough to allocate different programs like common kitchens and gardens, places for meetings and children to play, kindergartens, medical assistance, and weddings, among other events. The proposed water collection and storage extends its value beyond the functional infrastructure to become an element of activation for much-needed open spaces for gathering and social interactions across the camp. What if the zone along the Syria-Jordan border, where over 80,000 refugees are stranded, became water independent? No Man’s Land: A Water Commons is a commentary on the humanitarian crisis in the informal camps in the North-Eastern border zone between the Syrian and Jordanian berms, where over 80,000 refugees are stranded. Rather than viewing the zone as a holding area, this project proposes to reimagine the berm as an inhabitable productive landscape. By using fog harvesting, waste water management, permaculture and landscaping techniques, the project creates the possibility of an autonomous No Man’s Land. Through the harvesting of this scarce resource, the project is a response to the humanitarian crisis along Jordan’s northern borders and a long-term ecological approach to Jordan’s water infrastructure. Since 2011, The Jordan-Syria border has become the point of entry of a mass exodus of Syrian refugees. As the situation in Syria worsened, hundreds of thousands of people emigrated to Jordan by land. As the North-western border crossings began to close, refugees were forced to cross through the desert on the Eastern section of the Jordan-Syria border. Having transformed from an informal crossing to a militarized formal crossing point, the passage of Syrians fleeing through No Man’s Land was eventually blocked, turning it into a de-facto refugee camp within the border. The berms began to swell with refugees at two main points, Rukban (with around 77,500 refugees) and Hadalat (with around 7,500 refugees). Currently, there are two berms along the edges of the 1916 Sykes-Picot Jordan-Syria borderline - a line flanked by the aforementioned berms creating a seven kilometer wide “No Man’s Land.” The southern berm delineates the official point of entry into Jordan. Following an analysis of fog patterns across the region, the areas where the greatest amount of fog could be harvested were identified. Fog is produced when the heat absorbed by the earth during the day is released into the atmosphere during night, mixing with cool wind. The greater the temperature difference, the greater the amount of fog. This inversion makes arid climates optimal for fog harvesting. To ameliorate the current conditions facing refugees at the berm, the existing placement and congregations of tents were analyzed then compared with the UNHCR Emergency Guidelines for refugee camps community standards. Constructed sand berms serviced with facilities are proposed as an infrastructure to cluster refugees and service them as a clustering unit that is responsive to social ties. Each berm cluster consists approximately of 40 families, roughly 200 people. The clusters are serviced by combinations of fog towers that can collect 800-2000 liters of water daily, and shaded fog wells that can collect around 500 liters per day. The puncturing of the berm using on site tractors to allow delivery of resources and materials. Humanitarian aid trucks drop off materials needed for the construction of the shaded fog collector. Installation and assembly of the shaded fog collectors and solar panels. Refugees begin to cluster around fog collector. Additional resources trucked to the site to build fog towers and the backbone sanitation service infrastructure. Cut & Fill topography: Tractors begin creating a keyline from berm to plant, allowing water to channel from the cluster into the permaculture. Permaculture begins. Once the permaculture systems have matured, harvesting of food and resources such as date trees can begin to foster the communities’ self-sustainability. The shaded fog structure can be constructed by refugees from onsite material. The structure is built out of palm wood, while the mesh is knitted from ration sacks used to transport aid. This structure harvests enough drinking water while providing shade and congregational spaces. Some configurations are designed to harvest solar power for electricity. The large fog tower is built similarly but has the ability to harvest more water. The spiral structure carries the water collected from fog into an underground reservoir tank. The water collected is then channeled into the service spaces, permaculture, and shaded fog catchers. Clean water from the fog collectors is channeled into the showers and gray water into the latrines. The black water is channeled through the back of a berm into a constructed wetland to filter the water so it can be used for irrigation in the permaculture landscape. The Jordan Response Plan for the Syrian Crisis has received aid from organizations such as UNICEF, UNHCR, the International Red Cross, and other NGOs to provide resources to Syrian refugees in Jordan. The plan has allotted 2.6 billion dollars worth of aid, while our initially proposed intervention in Hadalat would cost roughly $110,000. The project seeks to respond to a humanitarian crisis created by a political conflict. While the conflict may remain keeping people in holding for the foreseeable future, a scenario that begs the question - could No Man’s Land turn into a future megacity? Or if the conflict subsides and refugees are able to return home - will this area become a ruin? Or, perhaps, a memorial of a precarious moment in time. What if a micro-scale, community-driven, water harvesting infrastructure challenged Jordan’s centralized water management system? This project challenges Jordan’s centralized water management system by introducing a localized, community-driven, and micro-scale water harvesting infrastructure as an alternative to mitigate the dependency on the present water distribution system in Jordan. Current agricultural practices consume up to 53% of the water available in the country. However, they contribute only 3% to the GDP. This project challenges the notion of water as a commodity to be distributed and controlled by the government, and proposes a move towards a more independent, and localized water commons. With this in mind, the project puts into question the current agricultural practices’ connection with the current land ownership pattern based on abstract property lines, disconnected from the land, its topography, and past understandings of territory. As a different form of cooperation occurs in this proposal, a self-sustainable agriculture community emerges, transforming the King Abdullah canal, which is already nearing the end of its useful life span, into an obsolete piece of infrastructure. To test this concept, one strategically located settlement was chosen: Deir ‘Alla. As a result of the construction of the King Abdullah Canal, this agriculture community has gone through tremendous change. The land reform policy (East Ghor Canal Project Law) was implemented in 1964, informed by the construction of the canal. The contradiction between the land reform policies and the traditional heritage law resulted in the current land fragmentation. The establishment of the Jordan Valley Authority in 1977 authorized the centralized water management in Jordan Valley. Water quota, which decides the amount of water distributed to each farm unit, was paired with certain crop patterns. The centralized water distribution management, based on pressure and price, changes the concept of water from a shared resources into a commodity. The agricultural sector in the Jordan Valley expanded tremendously after the construction of the canal. However, the developments of agriculture in the Valley fragmented the farmland limits further. The current agricultural practices, which are mostly based on mono-agriculture production, have resulted in a dysfunctional agriculture market in which both local farmers and migrant workers can barely make any profit. As a first step towards a localized rain water collection and water independence, the low points of the landscape are identified according to a carefully conducted analysis of the existing topography. The low points that are closer to main roads or existing settlements are selected and transformed into water nodes. Farmer co-ops are established around these nodes. The wadis on site form a gravity-driven, wastewater treatment and irrigation system, operating in parallel to the rainwater harvesting system. Centered around the necessity to collect water, the first phase proposes new water collection points, introduced at the low points mentioned above. Farmer co-ops are formed around these water collection nodes. Meanwhile, the potential wadis on the site are mobilized to divert flows of treated wastewater from Deir ‘Alla. Date palms are cultivated along the wadis. In the future, those will also serve for the construction of the housing units, as they generate fast-growing, renewable building material. The construction of the farmer co-op starts from the low points through a process of “cut and fill” operations. This will leverage the existing micro-topography on site as new water infrastructure. Farmers start to gather and occupy around these water collection points, which will then be transformed into “water nodes”. The greenhouses, an existing typology in this area, will support this shift. As these structures are being established, they will be transformed from being solely agriculture production tools into a water infrastructure system, offering the farmers additional sources to collect water. In addition, these greenhouses may serve for potential upgrades, where hydroponic systems can be introduced. The structure of the greenhouse itself can also be altered and adapted to hold different programs, such as food processing. In addition, settlements for migrant workers are placed around the water nodes. These newly introduced housing typologies improve livelihoods and enhance social conditions by introducing education and leisure programs. As the new co-op is being established, new collaborations lead to other means of agriculture. The co-op also facilitates new potential initiatives. For instance, “co-agriculture laboratories” can be formed as a trial to further explore and test different innovative forms of agriculture. A social credits program is introduced based on a virtual currency system, aimed to generate a mechanism to connect the users to education, technology, and other initiatives to empower the community. By implementing these forms of collaboration, this projects aims to gradually form a network of regional water collaboration and a comprehensive agriculture business to truly benefit the agriculture community in the Jordan Valley. In the sample farmer co-op unit, three typologies will be implemented. Co-housing is introduced to improve the living conditions of migrant workers on site. Different housing typologies are introduced to meet the demands of various family structures and lifestyles. For example, the family friendly housing clusters provide housing for the migrant worker living with their families, while the co-living housing clusters provide housing for those who work on site alone, as well as seasonal workers. The structure of co-housing would be funded by the Jordan Valley Authority, as part of the localized rainwater harvesting system. After the construction of the structure of co-housing, the migrant workers on site can use localized material, for example stones, mud bricks, and dried date leaves to complete the construction of their housing. As the farmer co-op is implemented, co-hiring programs can be established to enable post-production value-adding processes. Co-Food Processing host various kinds of value-adding processes from washing, packaging to the processing of agricultural products. It can also link the farmer co-ops to local restaurants, grocery stores, and wholesalers as a way to gradually break the mono-functional agriculture market. In the last phase, Co-Agricultural Laboratories are established to test other means of agriculture, for example, organic farm, aquaponics, etc. Different parties and players, like experts from USAID and eco-consultants, scholars, researchers and students from the College of Agriculture in the University of Jordan, etc. can get involved. Meanwhile, different programs can be held here, like agriculture research and experimentation programs, internships, and training programs. What if agriculture and tourism around the Dead Sea were reimagined to heal the Jordan Valley’s ecology? Jordan is one of the most water-scarce countries in the world. To meet the growing demand for water in the country, Jordan has developed a centralized water supply system to provide water to urban settlements, agriculture, tourism and other industries. However, this massive, energy-intensive piped system loses a significant percentage of water to leakage and is vulnerable to climate change and energy markets. Among different industries served by this large-scale water infrastructure, traditional agriculture consumes 72% percent of water, while only contributing 3% of the country’s GDP, creating a widening gap between farmers, markets, and benefits. On the other hand the traditional tourism sector gets unlimited water supply, yet serves only tourists and providing minimal benefits to the surrounding local communities. Both industries are extracting water and other resources from the landscape, while giving very little in return. Undoubtedly, new patterns are needed for both industries. Our project proposes to bring together the agricultural and tourism sectors to generate shared economic and ecological benefits. In fact, new potentials already exist. The Dead Sea is natural resource renowned throughout the world for its unique qualities. The Dead Sea is also threatened with disappearance and retreats approximately a meter per year. How can it be saved? Its water, mud and air all have medicinal and healing potential. Its special geographic features give birth to an abundance of unique species, including many medical plants, providing the agriculture sector great opportunities for growth and diversification, both suitable for the local environment and of higher economic values. This area is also an important node on the International Migration Flyway of birds, making it a unique attraction for bird watchers worldwide. Moreover, it is near Amman, an important center of medical tourism for the region. These conditions enable the development and combination of medical farming and medical tourism in this area. Together these new patterns from both industries can be reimagined to operate as a whole to help heal the fragile ecosystem and support the endangered natural species as well as benefit the local population. The project is situated at the meeting point of a developed hotel area, an expanding agricultural village and a shrinking important bird habitat. By working on the cross section from the village down to the Dead Sea, the project aims to reorganize the terrain towards avoiding the existing water injustice and water waste, and use medical farming and medical tourism to fill the gap between the segregated hotels, village and the Dead Sea. The linear zone in the middle acts as a major medical-agro-tourism axis which would gradually expand, connecting with the existing natural reserve area to create a holistic productive landscape that weaves different systems together. The existing wadi that channels the most rain water, according to a water flow analysis and calculation, was chosen as the main axis. Grey water from both the village and the hotels will be collected and conveyed to the main wadi as well as the nearby natural reserve. 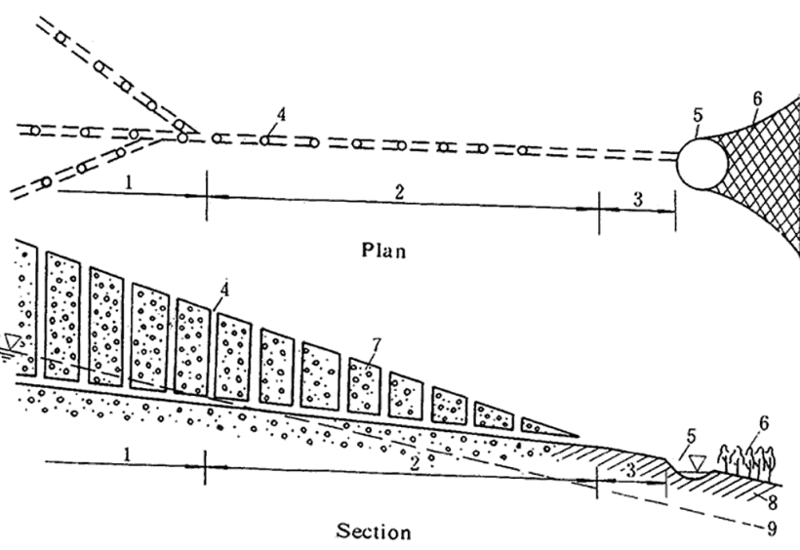 Retaining walls are proposed to distribute water from the main wadi to both sides and used to collect water for future agriculture irrigation. Retaining walls are arranged according to the topography, and soil will be replaced from its front to its back to create terraces. Local villagers will play a key role in construction. The first group of housing is constructed for local villagers to farm here. Medicinal plants naturally growing around the Dead Sea area will be will be cultivated in specific lots according to their varying habits. Fab and The factory is built for the manufacturing of medical plants and at the early stage, it will be a rather centralized process. Finally, tourism is introduced. More healing hotels are built by the retaining walls, and medical pools are created near the Dead Sea. Different programs and infrastructures are inserted to attract a variety of tourists, especially medical tourists from Amman in need of recovery period. The production process will be rather decentralized into each unit. Only medical plants that require high expertise for production will be manufactured in the factory, then distributed to each healing hotel unit. On-site tanks and wastewater treatment plants are used to treat the gray water from the village. Retaining walls stop the rain water runoff and collect them for irrigation as well as feeding the wadis and the Dead Sea. The healing hotels, medical farmlands, tamarisk natural reserve and different medical pools weave together from the village to the Dead Sea and create a continuous medical-agro-tourism zone that benefits both local people and the natural environment, as well as the different industries involved. The units located on the higher, Eastern area consist of healing hotels and medical farms. Run-off water from the upper terrace is collected by the retaining wall and gathered by the tank underground to irrigate the medical farms and preserve the area on the lower terrace. Healing hotels are built by the retaining walls, and narrow courtyards are inserted between the two for ventilation and cooling purposes. In Winter, which is the typical season for tourism and cultivation in the Dead Sea area due to the mild weather, medical plants are seeded and start to grow. Courtyards between the retaining walls and the buildings become public spaces supporting different activities. In Summer, when traditional farming plants cannot be grown, medical plants like saltbush, balsam and tamarisk that suit the hot environment will blossom, creating a new landscape to attract visitors and extend the cultivation period, therefore increasing its productivity. The medical farmlands will also provide food to birds breeding here and provide them habitats. Taking advantage of the Dead Sea’s unique healing properties, mud pools, salt pools and water pools that have different healing effects are arranged in different locations according to their distance from the Dead Sea shore. All of them are accessible to tourists as well as the local community. Retaining walls are used to redirect water and prevent water from entering the mud pools and sand pools. All the water from the pools will eventually return to the Dead Sea. Since the coastline changes depending on the season, the landscape of the pools will also change accordingly. In winter, with more rainfall, there are more water and mineral pools. In summer, the salt pool will rise in density with the higher temperature, and most wadis will dry out. Meanwhile, the medical plants nearby will blossom. Visitors can enjoy the pools among medical flowers. What if the Jordan River Border was re-conceptualized to convert dangerous minefields into an evolving landscape? The border between Jordan, on the east and Israel and Palestine’s West Bank, on the west, is defined by the Jordan River - a border that is demarcated as a militarized zone. To prevent border crossings, landmines have been arranged in large bands on either side with military posts positioned strategically. This enforces the borderline, and allows only those with a permit to access the river. The threat of the landmines has deterred investments in the valley inhibiting economic growth and harming local communities. The superimposition of political boundaries has diverted freshwater resources from the larger ecosystem of the Jordan River Valley and divided it among different competing states. All of these entities extract natural resources but are not held accountable for the consequences of these actions. This has resulted in the river becoming a thin stream of pollution, thus turning the lush valley into a deteriorating fragmented ecosystem. To address the failing system, an expansion of the border from a line into a zone through the reshaping of the riverbed is proposed. In this way, the Jordan River itself, and the border that traces it, can be transformed from a divisive tool to a shared, productive resource benefiting all sides. By demining the border we can facilitate ecological and cultural regeneration. National Committee for Demining and Rehabilitation will remove the remaining 20% of landmines that were leftover from the original demining initiative from 1993 to 2008. The landmines remain in the valley because their exact location was not known. Lack of knowledge about original placement, and repositioning due to flooding, erosion, and growth of vegetation has made their location hard to predict. In unfarmed pockets where landmines are suspected, a swarm of drones will plant Thale-Cress seeds, spray fertilizer, and water growing plants. The engineered plant reacts to the nitrogen dioxide emitted from unexploded landmines causing a change in color from green to red signifying the location of landmines. Over the course of three to five weeks, the drones will be used to monitor color changes and help the Jordanian Army plan safe demining paths. The landmines will be detonated and with their explosive elimination, a new cratered landscape will emerge. The Riverbed/ Water as sculptor In the newly cratered landscape, water will be used to further shape the riverbed into a series of ponds and streams that will be used to purify water pollutants. Using the water flow analysis, gray water from the local town will be channeled to the river pockets for purification.This influx of water will help to reshape the riverbed by naturally connecting craters to the river. The greywater path will be planted with several water filtration species that will help to densify the fragmented biotic components of the riverbed ecology. The purified water will be used to irrigate the agricultural lands that run adjacent to the river, eliminating the need to truck water from far distances. With a comprehensive approach to a decentralized water infrastructure system within Jordan [ie: local waste water recycling, rainwater capture, and fog harvesting - the strategies depicted in this book] less water will be diverted from the Jordan River Basin allowing for the increase of water to flow in the river and to the Dead Sea. The resulting increase of water volume in the Jordan River Valley will help dilute existing pollutants and help the river to naturally re-meander in the cratered pockets which are planted to help filter the river water. As the process of demining is happening, the Jordan Valley Authority will monitor the quality of the abiotic components of the Jordan River Valley. Jordanian Universities will work with local fisheries to establish experimental agricultural greenhouse laboratories within the newly created ecology that research water-reduction techniques in crops types, farming and irrigation. The new techniques will be shared with the local farmers. Implementation will result in the lower dependency of water, increase of profitability and significant reduction of pollution in the river creating a more holistic and sustainable farming culture. Within the net of the river, natural meanders, and water craters, the rehabilitation of fragmented ecosystem will be forefronted as essential in the support of the new water purification ecology. The densification of native plants and the fortification of bird habitats will ensure birds assist in the rehabilitation by spreading seeds.This will strengthen the threatened ecology of the Jordan River Valley. Ecopark, a not-for-profit organization will work with local environmental activists to monitor the biotic components of the Jordan River Valley. By appropriating the landmine we invert the tool that was used to crystallize the border into a tool to expand it, giving it an instinctive and unpredictable width, thus creating a new lens from which to understand the existing condition. From a borderline to a borderfield Although the border divides the Jordan River Valley, the larger ecosystem invites a trans-boundary approach to addressing the issues of pollution and water diversion threatening the valley.